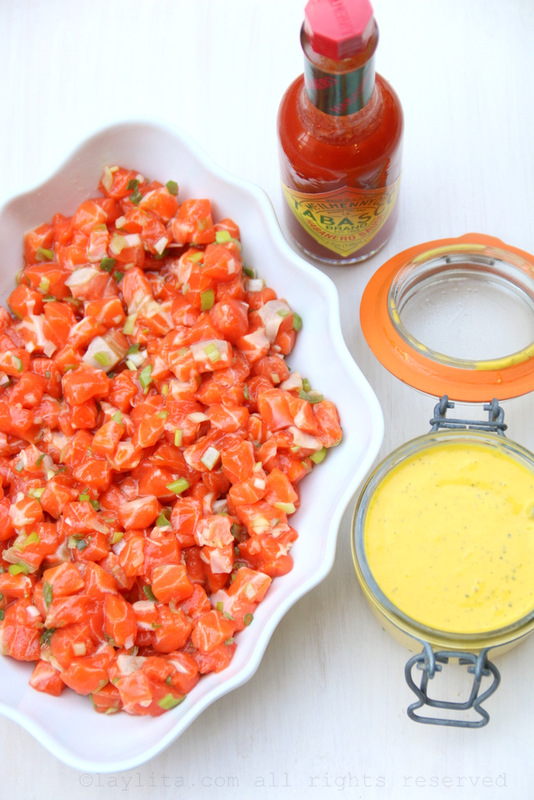 This delicious recipe for avocado and salmon tartare with mango habanero sauce was inspired by a fun visit to Tabasco that I took earlier this year. 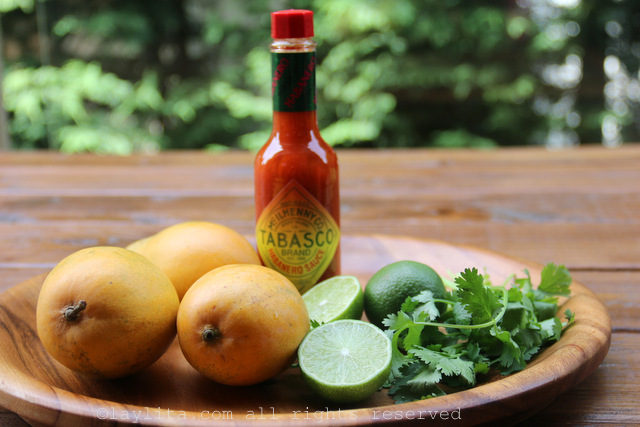 In March, I was invited to be part of the Tabasco Tastemakers and visit Tabasco on Avery Island in Louisiana. I’ve always been a fan of Tabasco hot sauces and it sounded like a great opportunity, so of course I said yes. It turned out to be a wonderful experience and exceeded my expectations. 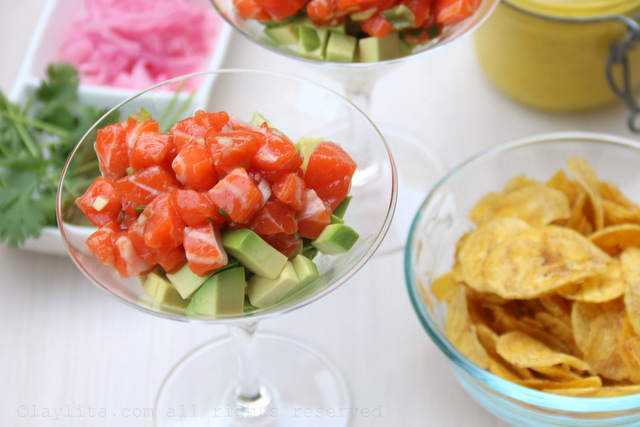 Delicious and easy to prepare recipe for avocado and salmon tartare with mango habanero sauce, can be prepared and served three ways: salmon tartare stuffed avocados, avocado and salmon tartare in cocktail glasses, and patacones/tostones plantain chips topped with avocado salmon tartare. 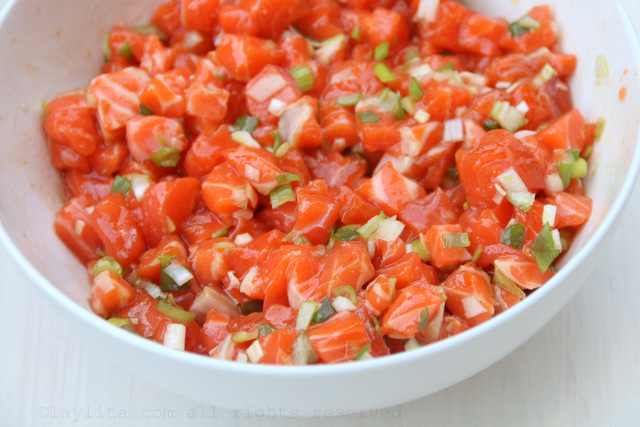 Combine all the ingredients for the salmon tartare in a ceramic or glass bowl, mix well, cover and refrigerate while you prepare the mango habanero sauce. 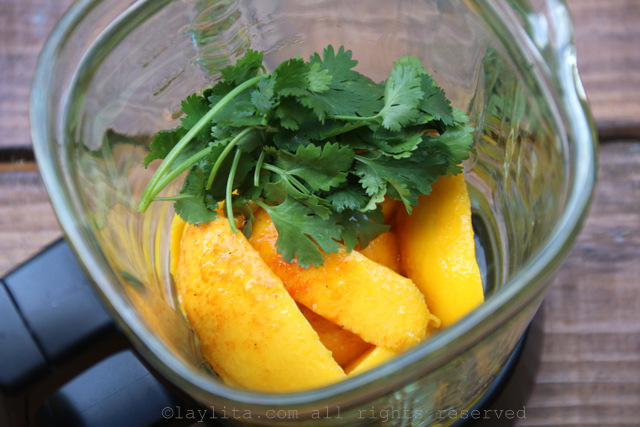 Place the mango slices, lime juice, olive oil, Tabasco habanero sauce (start with 1 tsp and add more until it has the desired level of heat), cilantro, and salt (about ½ tsp) in the blender. 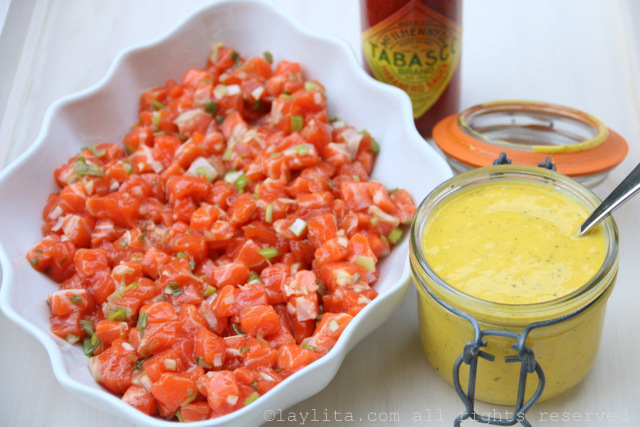 Blend until you have a smooth sauce, taste and adjust the amount of Tabasco and salt based on your preference. 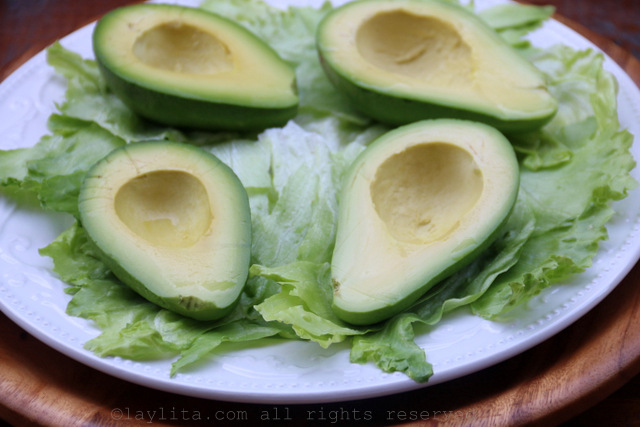 Cut the 4 avocados in half lengthwise, remove the pit or seed, and carefully peel the avocados. 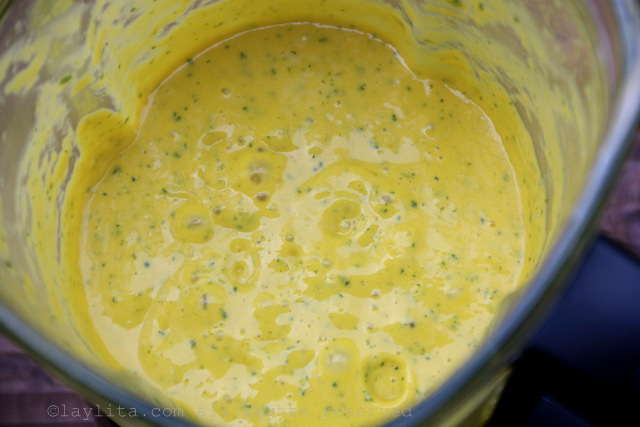 Drizzle each avocado with a little bit of lime juice. 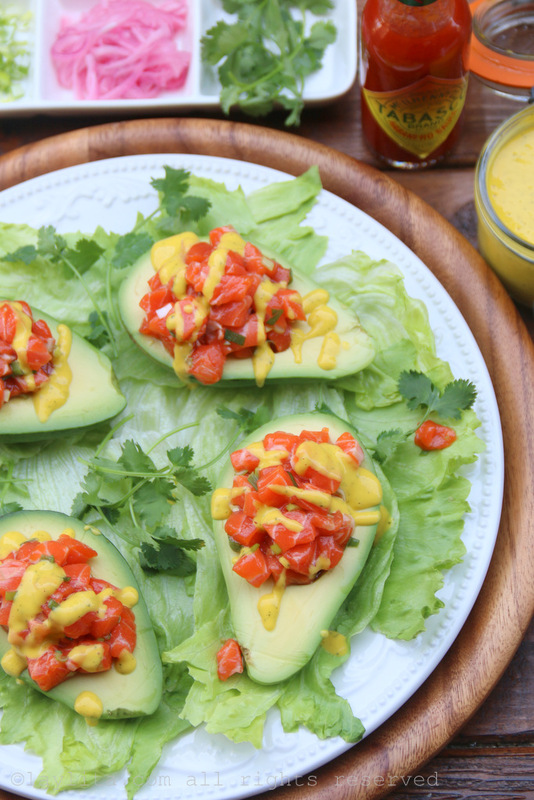 Fill the center of each avocado with a generous portion of salmon tartare, and drizzle the spicy mango habanero sauce on top of each stuffed avocado. 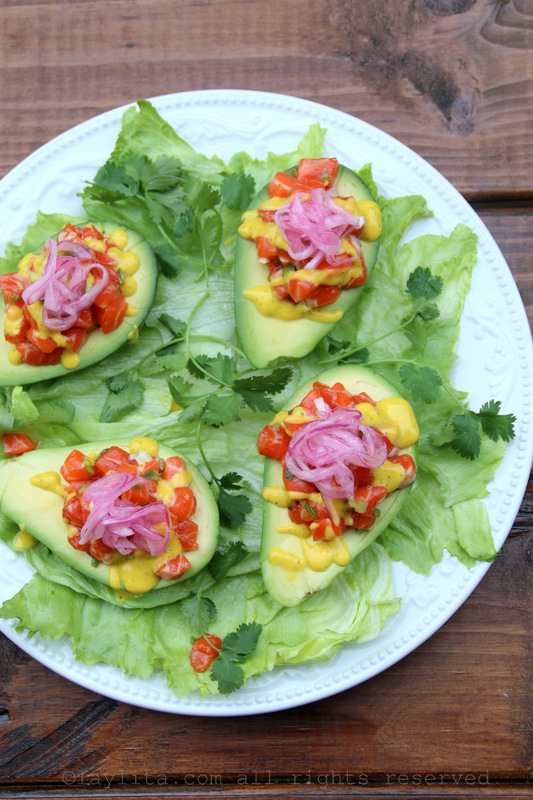 Place the stuffed avocados on plate garnished with lettuce leaves and garnish the avocados with cebollas encurtidas or lime pickled red onions and cilantro leaves. Serve immediately. 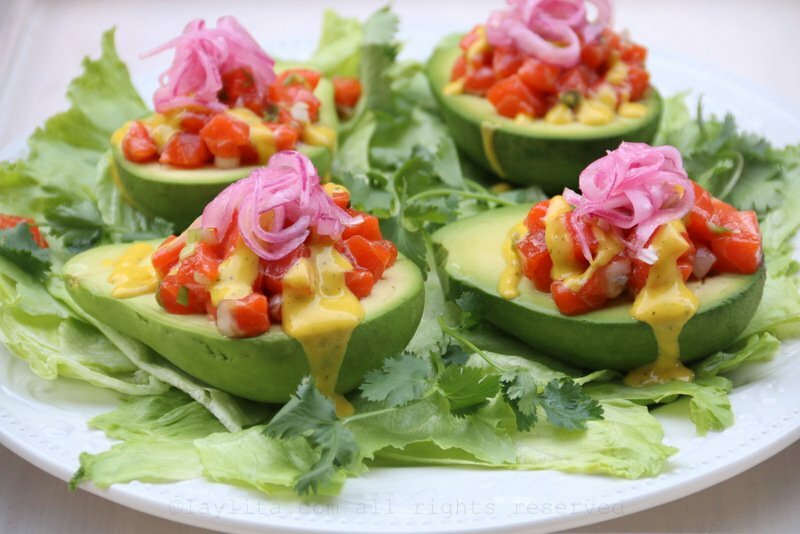 Cut 2 avocados into small cubes, mix with lime juice, olive oil and salt to taste. 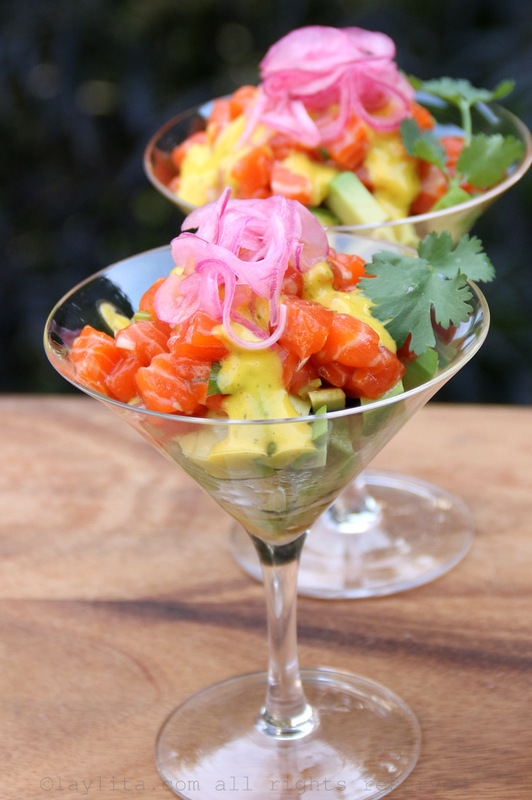 Place a spoonful of the diced avocado in a cocktail glass, add the salmon tartare, drizzle with the mango habanera sauce and top with red pickled onions and cilantro leaves. Serve immediately. 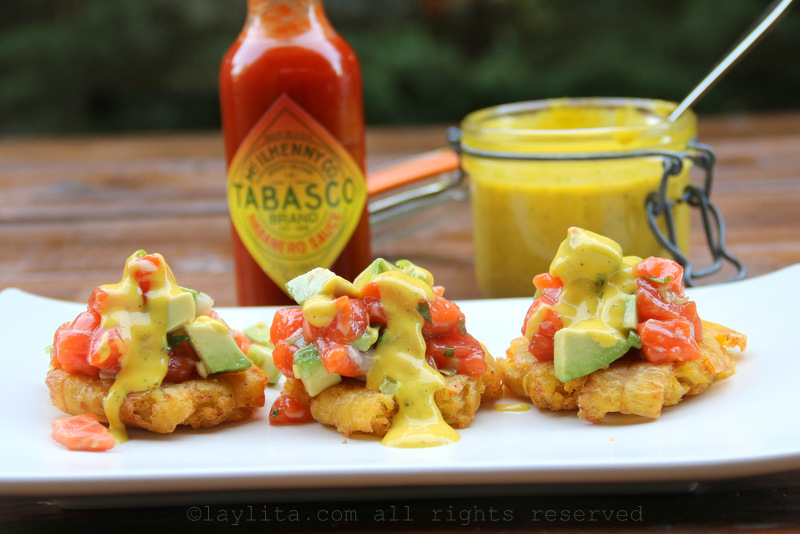 This appetizer can also be garnished/served with thin plantain chips or cassava yuca/chips. 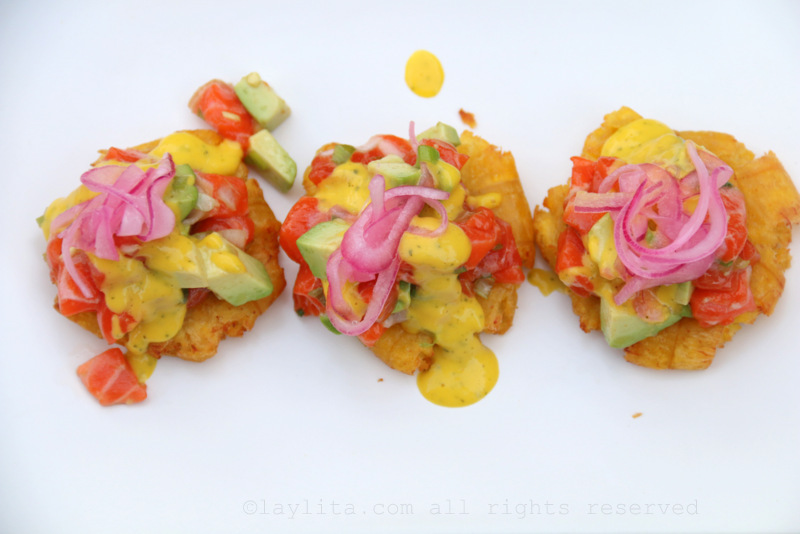 Prepare the patacones or tostones, recipe and instructions are here. 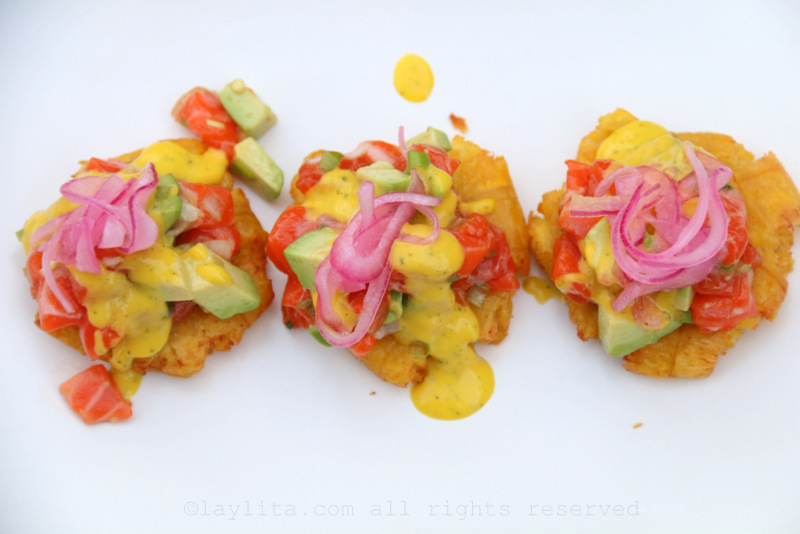 To serve 8 people, use 4 medium sized green plantains (you get about 4-5 patacones per plantain). 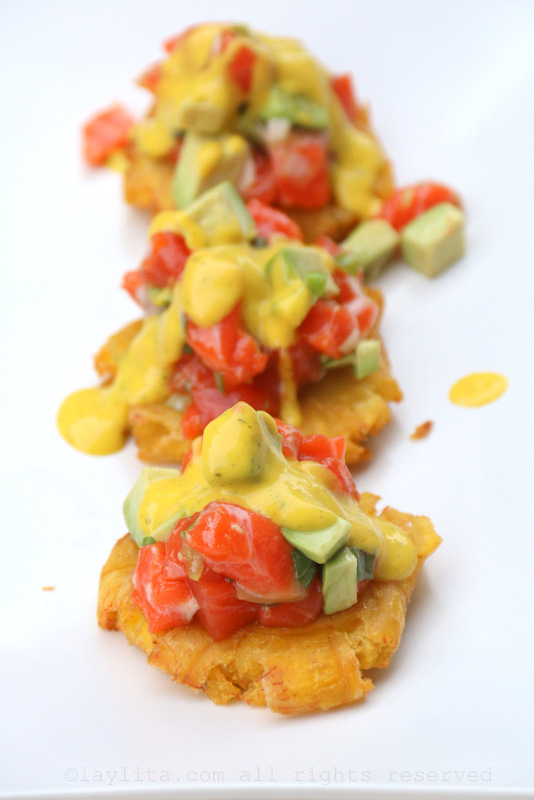 Once the patacones are ready, cut 2 avocados into small cubes and mix the cubes with the salmon tartare. 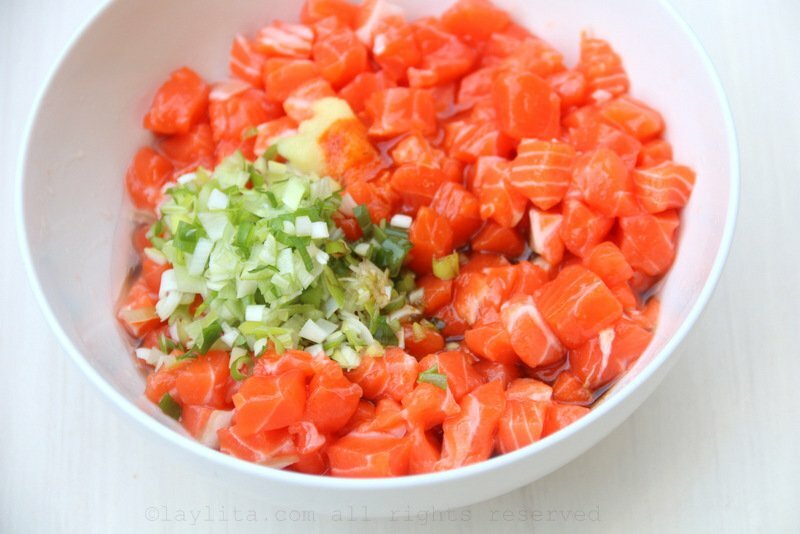 Add a drizzle of lime juice and a sprinkle of salt if desired. 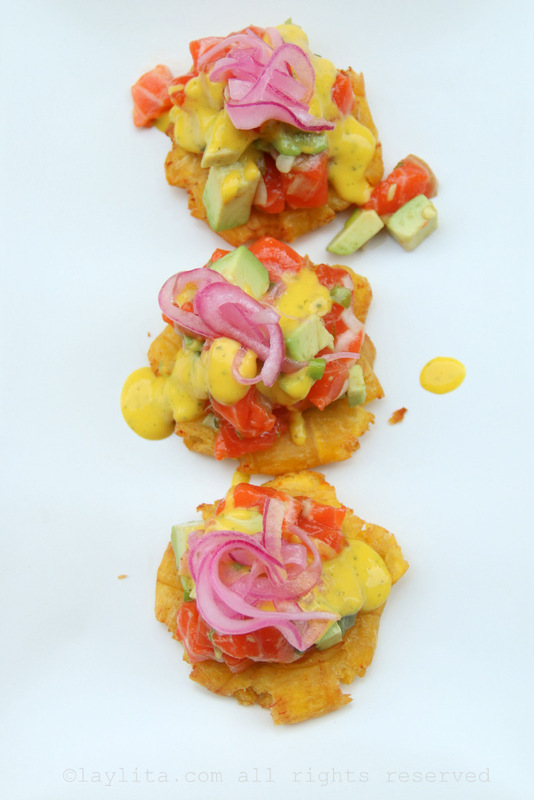 Top the patacones or tostones plantain chips with a spoonful of the avocado salmon tartare, add a drizzle of mango habanero sauce, and red pickled onions. Serve immediately. 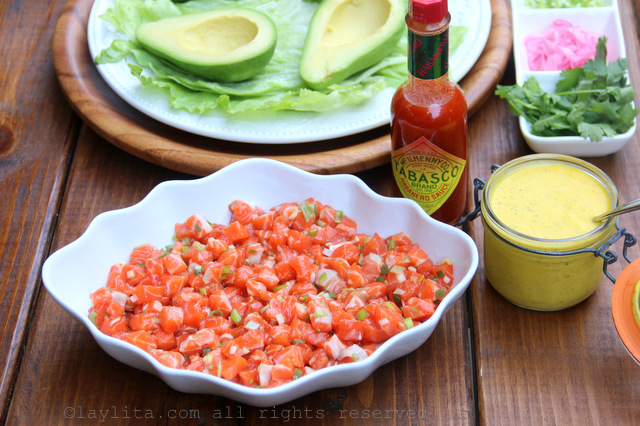 For this salmon avocado tartare recipe I decide to use the Habanero sauce, and it does happen to be their spiciest hot sauce (based on the Scoville Heat Scale). 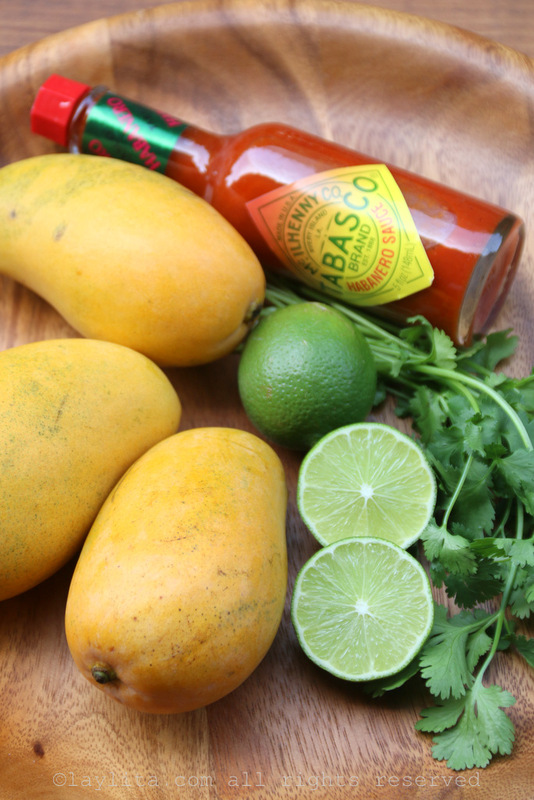 Now, before those of you who aren’t fans of super spicy foods get scared, let me add that the Tabasco Habanero sauce is also very flavorful and in addition to the already awesome habanero peppers, it also has mango, banana, papaya, and tamarind puree so the final result is a delicious tropical tasting hot sauce – and it’s very easy to adjust the amount of Tabasco in a recipe so that you keep the flavor and reduce the heat, or go in the opposite direction and increase the heat if you prefer. 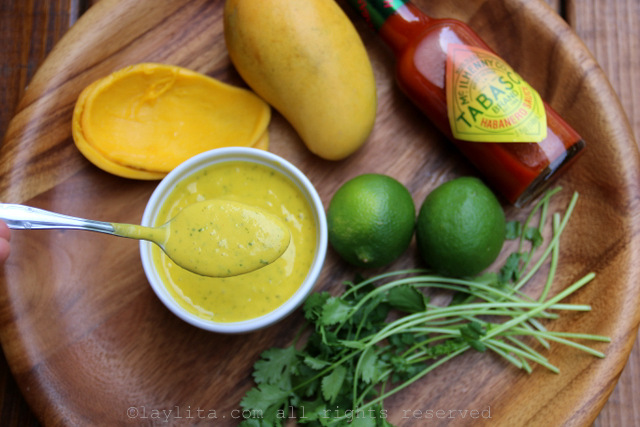 I made a fresh sauce using ripe mangos, lime juice, cilantro, and olive oil. 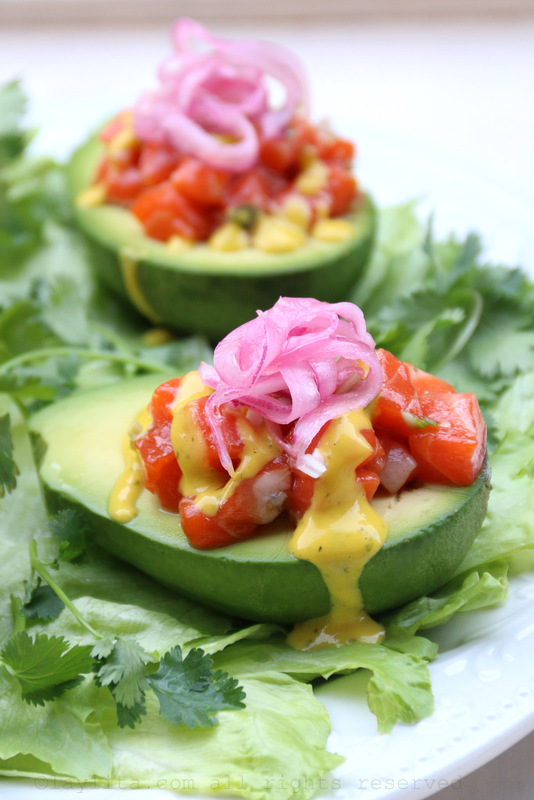 The flavor and spice of the Habanero sauce was the perfect addition to this sauce – which gives this avocado and salmon tartare that wonderful tropical Latin touch. I couldn’t make up my mind (as usual) about how to serve the salmon tartare, so I tried serving it three different ways, and they were all a delicious success. 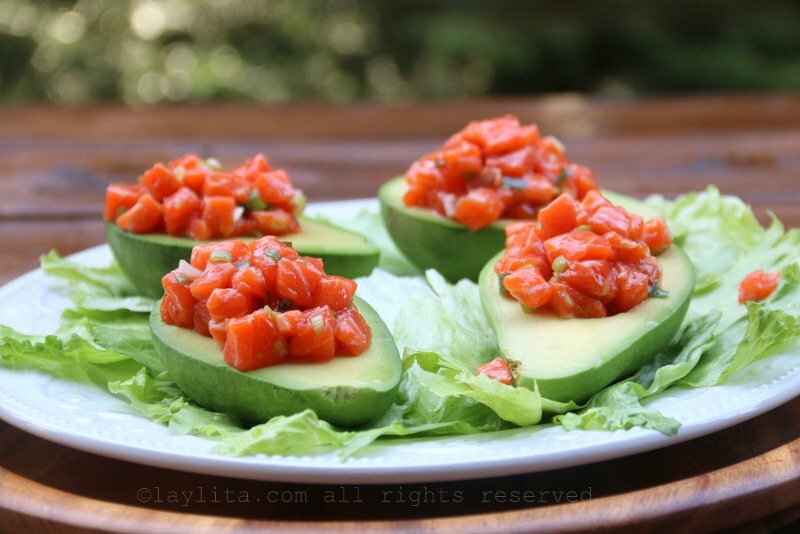 The first option is to serve the salmon tartare stuffed in avocados. 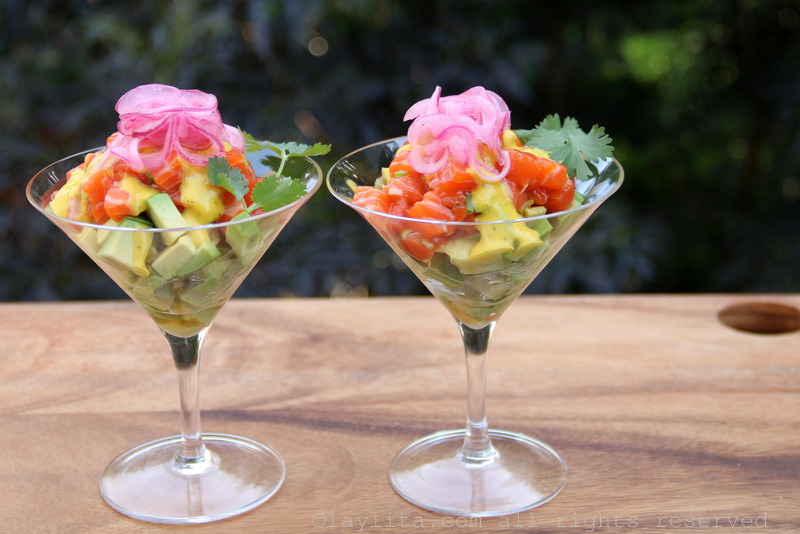 The second option is to dice the avocado, toss it with lime, olive oil and salt, then serve the diced avocado and salmon tartare in a cocktail glass. 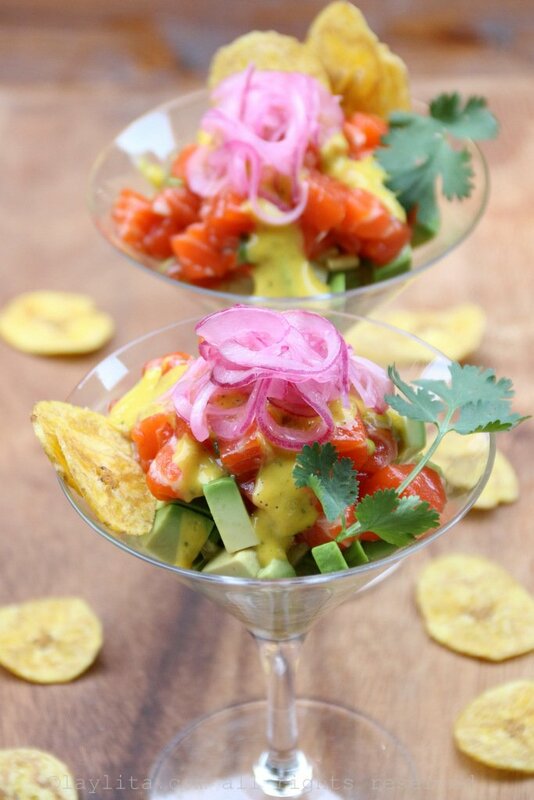 The third way is to combine the diced avocado with the salmon tartare and serve it as a topping for patacones or tostones – ie thick green plantain chips. 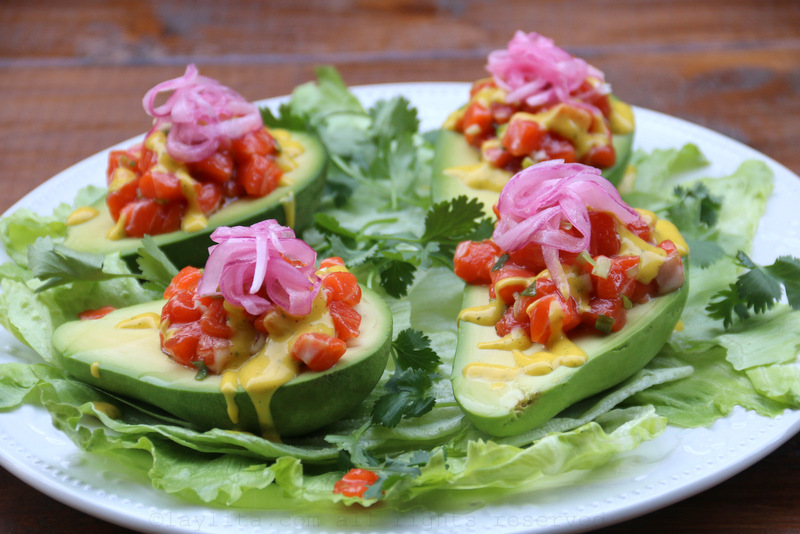 All three of these avocado salmon tartare dishes are served topped with the mango habanero sauce and cebollas encurtidas or lime pickled red onions. 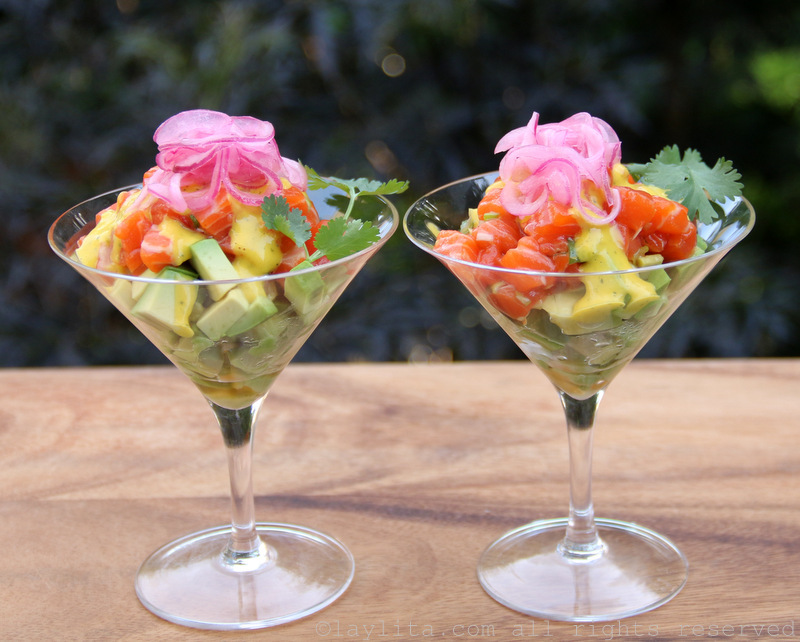 Maybe you will be better than I was at choosing a favorite way to eat the avocado and salmon tartare, the preparation and ingredients are almost the same for all serving options. 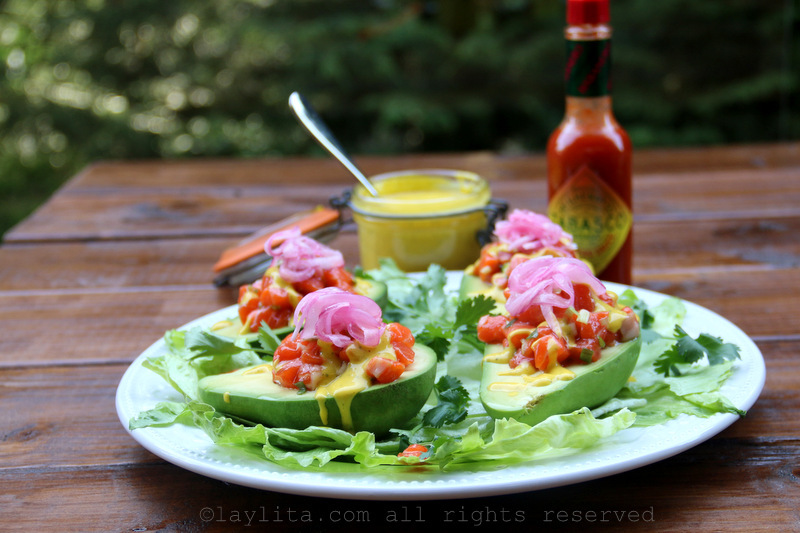 The main change is that for the salmon tartare stuffed avocado option, you will need 4 avocados, and for the other options it will be enough with just 2 avocados. 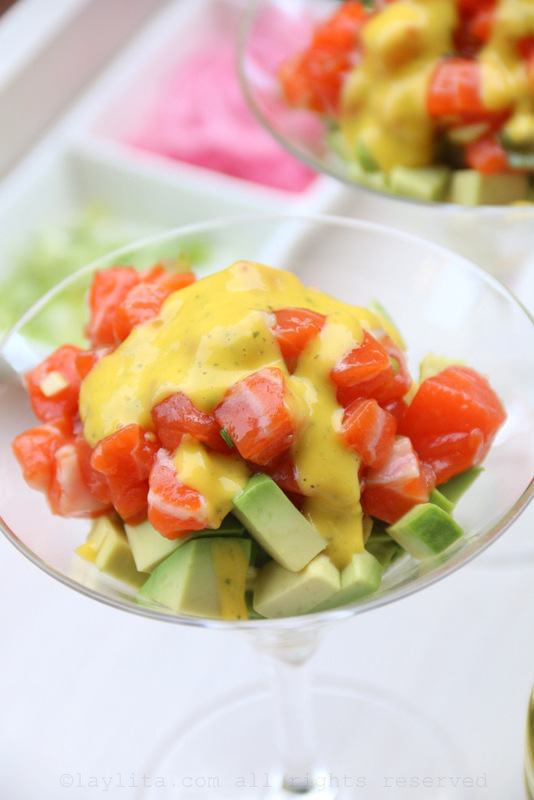 The avocado filled with salmon tartare is also a larger sized and more filling appetizer, while the avocado salmon tartare served in cocktail glasses or as topping for tostones is more of smaller bite sized appetizer and could be stretched to serve a larger number of people. *Disclosure: Thanks to Tabasco for sponsoring my trip and this post. All photos, recipes, opinions, and ideas are 100% my own. this looks so amazing, I cannot wait to try it. 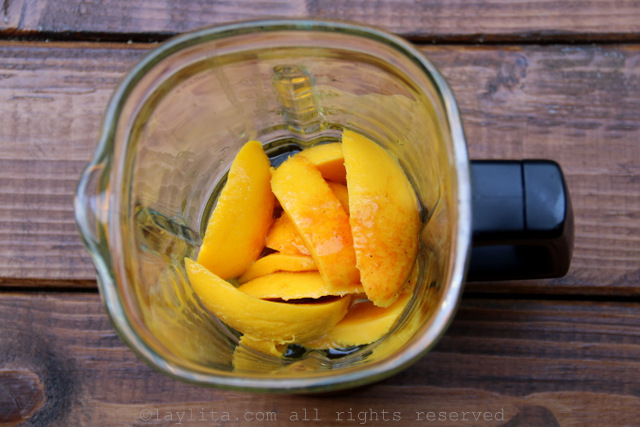 It combines some of my favorite ingredients. Thanks for sharing. 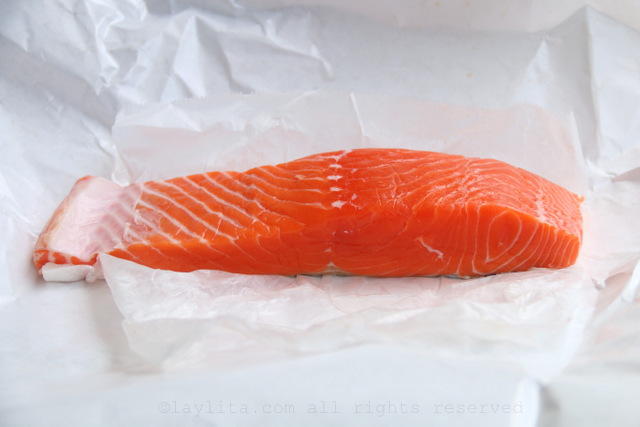 Wondering if I would be able to substitute tuna for the salmon, what do you think? I live in Singapore where tuna is more popular (and fresher) than salmon but I’m not quire sure if the mango/tuna combo would work. I would really like your opinion! 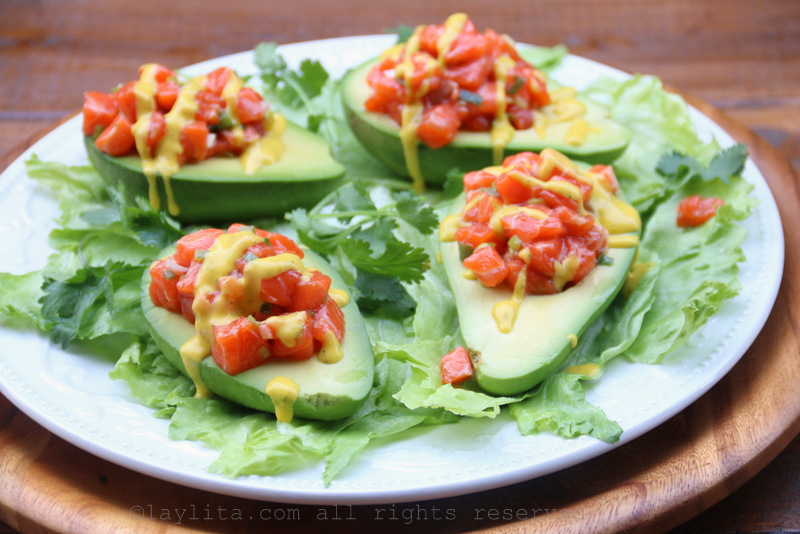 Go for it, fresh tuna works really well with mango/avocado! Your trip to Avery Island sounds like so much fun! 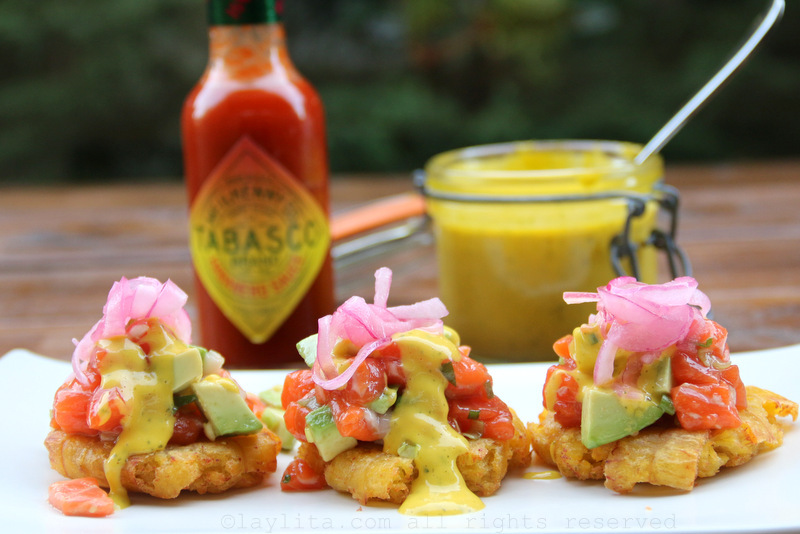 Gorgeous recipe too! That whole recipe is simply OFF Da Hook wild and awesome looking. 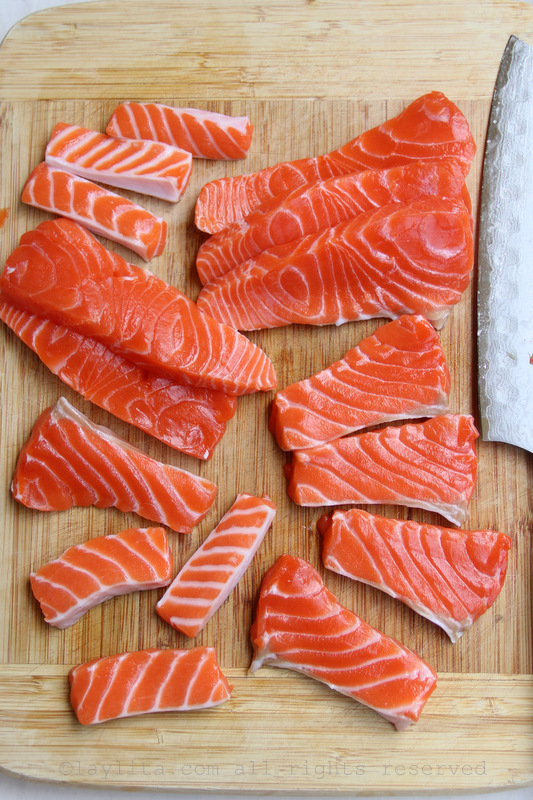 Especially in the creative use of the Avocado and using Salmon with it like you did. 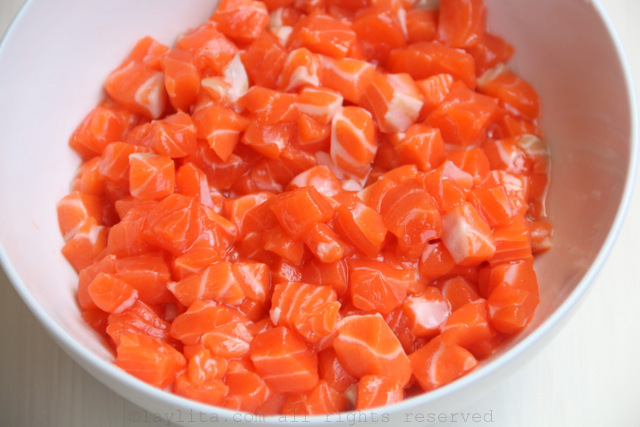 I have to make this and the various versions of this dish because this looks too creative to not try for the imagination on a coming over guest. 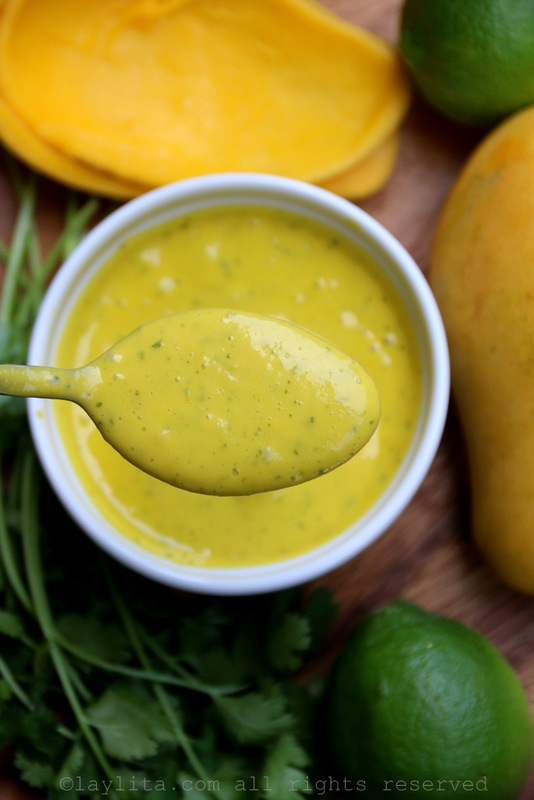 This dish and the Mango sauce is just too impressive to boot.